David Gareja (Georgian: დავითგარეჯის სამონასტრო კომპლექსი, Davit’garejis samonastro komplek’si; Azerbaijani: Keşiş dağ məbədi) is a rock-hewn Georgian Orthodox monastery complex located in the Kakheti region of Eastern Georgia, on the half-desert slopes of Mount Gareja, some 60 – 70 km southeast of Georgia’s capital Tbilisi. 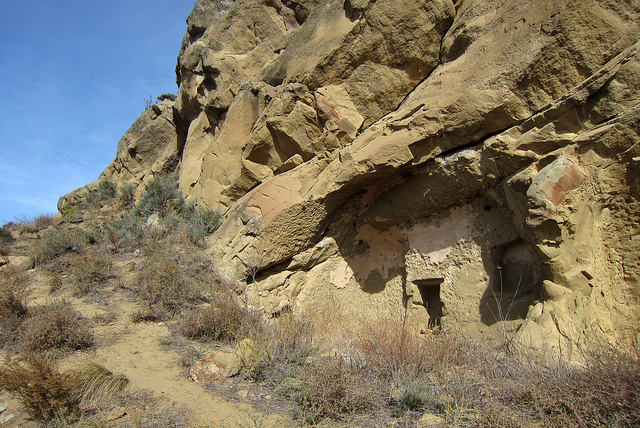 The complex includes hundreds of cells, churches, chapels, refectories and living quarters hollowed out of the rock face. Part of the complex is located in the Agstafa rayon of Azerbaijan and has become subject to a border dispute between Georgia and Azerbaijan. 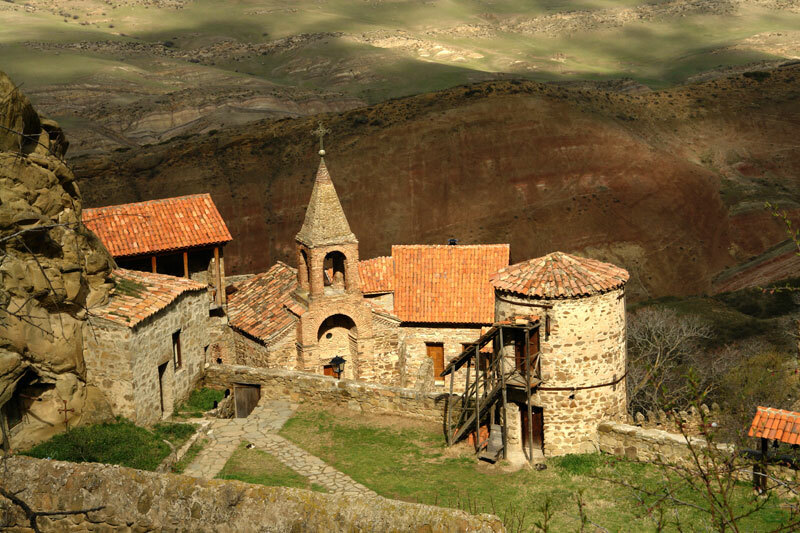 The complex was founded in the 6th century by David (St. David Garejeli), one of the thirteen Assyrian monks who arrived in the country at the same time. 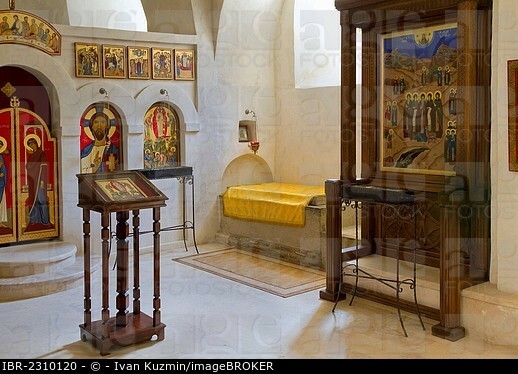 His disciples Dodo and Luciane expanded the original lavra and founded two other monasteries known as Dodo’s Rka (literally, “the horn of Dodo”) and Natlismtsemeli (“the Baptist”). 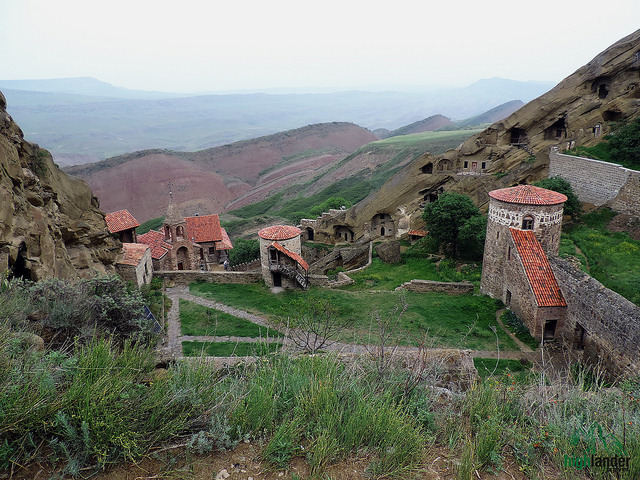 The monastery saw further development under the guidance of the 9th-century Georgian saint Ilarion. The convent was particularly patronized by the Georgian royal and noble families. The 12th-century Georgian King Demetre I, the author of the famous Georgian hymn “Thou Art a Vineyard”, even chose David Gareja as a place of his confinement after he abdicated the throne. Despite the harsh environment, the monastery remained an important centre of religious and cultural activity for many centuries; at certain periods the monasteries owned extensive agricultural lands and many villages. The renaissance of fresco painting chronologically coincides with the general development of the life in the David Gareja monasteries. The high artistic skill of David Gareja frescoes made them an indispensable part of world treasure. From the late 11th to the early 13th centuries, the economic and cultural development of David Gareja reached its highest phase, reflecting the general prosperity of the medieval Kingdom of Georgia. New monasteries Udabno, Bertubani and Chichkhituri were built, the old ones were enlarged and re-organized. 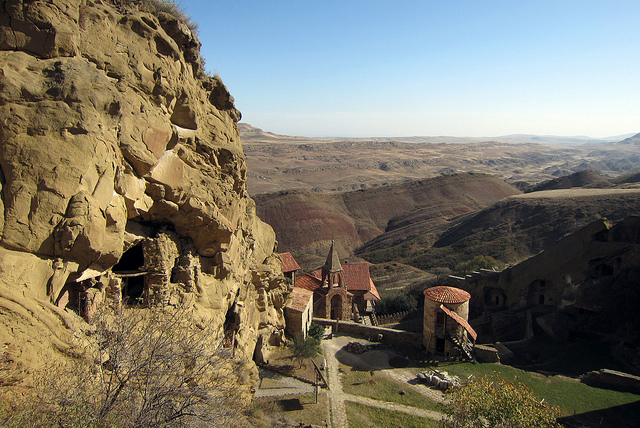 With the downfall of the Georgian monarchy, the monastery suffered a lengthy period of decline and devastation by the Mongol army (1265), but was later restored by the Georgian kings. It survived the Safavid attack of 1615, when the monks were massacred and the monastery’s unique manuscripts and important works of Georgian art destroyed, to be resurrected under Onopre Machutadze, who was appointed Father Superior of David Gareja in 1690. 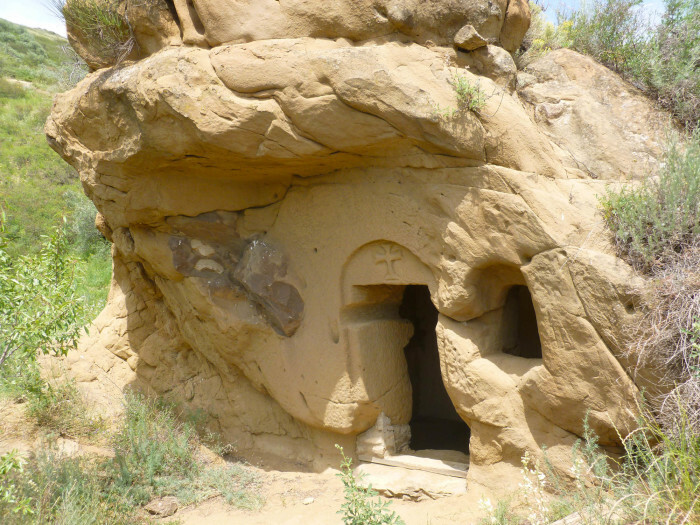 “David Gareja desert occupies south-eastern part of East Georgia, with its closest edge in a distance of some 60 km south-east from Tbilisi. This is a very specific area with multicolor hillocks, dry gorges and gullies, small areas of green land with trees and shrubs. This place had been inhabited sins the Pre-Christian era, but afterwards humans abandoned it, until the VI c. AD, when one of the 13 Assyrian fathers, St. David, called “Garejeli” choose that area as a place of his hermitary. 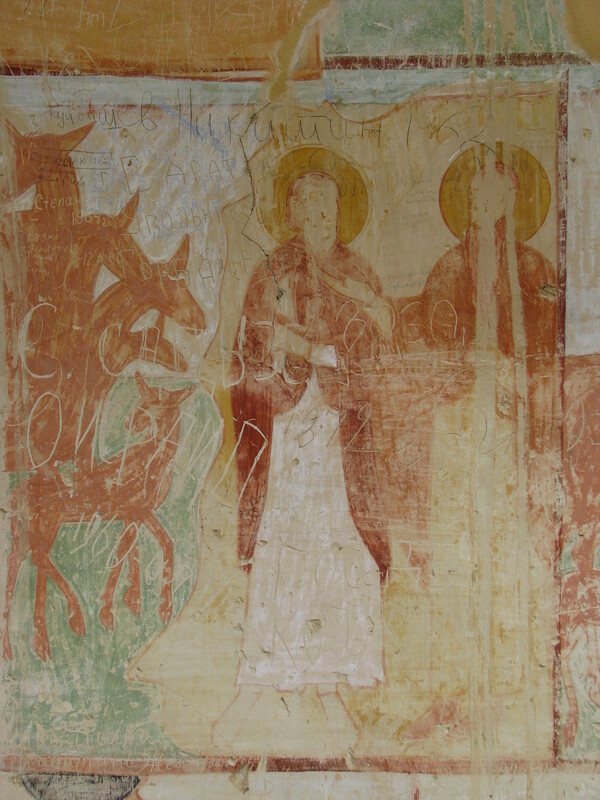 St. David came together with his disciple – Lukian and they settled in a small natural cave. Shortly after this many other hermits joined them so by the times when St. David was still alive three new cut in the rock save heavens, were established – St. David’s Laura, so called Dodorka Monastery in the Virgin, founded by one of St. David’s disciple St. Dodo on the horn-shape rock extension and John the Baptist Monastery. The very first church was also constructed here in times, when St. David was still alive. One local noble lay-man, certain Bubakar, converted into orthodoxy and baptized by St. David built a small church on the lower terrace of the nowadays Laura, dedicated to one of the greatest Christian miracles – Saint Metamorphoses. After their death St. David and Lukian were buried in this church. Both the initial and the very first of subsequent hermit cells were simple in shape and small in size, almost undistinguishable from natural caves. 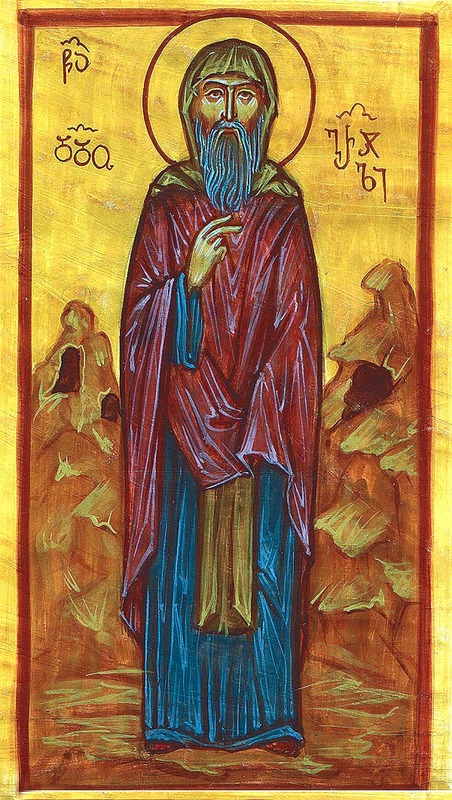 The situation changed in mid-IX century when the monk very famed both in Georgia and Byzantium, St. Illarion the Georgian (who continued his hermitry in Thessaloniki where he passed away) was elected the head of David-Gareji brotherhood. 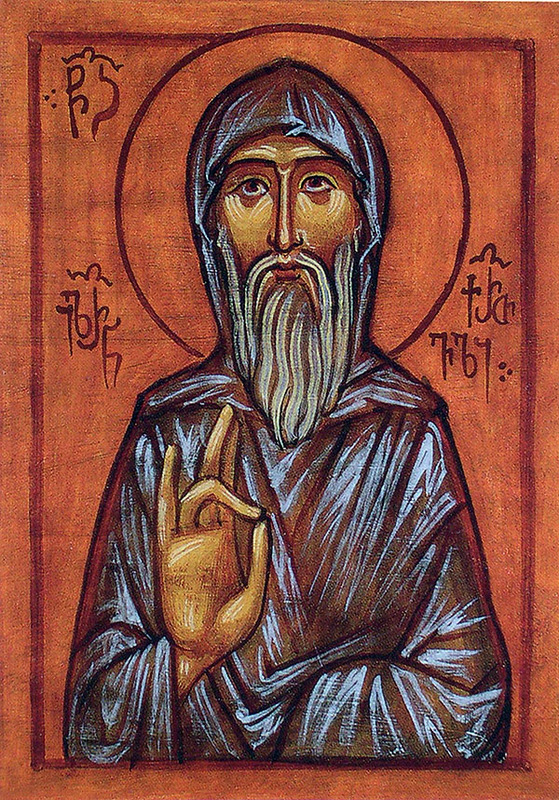 “The life of Saint David, founder of the David-Garejeli monastery in Eastern Georgia, belongs to the cycle of biographies known as “The Lives of the Syrian Fathers”, most of which were composed by the Catholicos Arsenius II of Georgia (c. 955-80). To these Syrian Fathers is ascribed the introduction of monastic institutions into Georgia. The historical background of their mission has been the subject of considerable discussion, especially as their biographies, in their present form, were not composed until four centuries after their deaths, with the result that facts are overlaid with legend and myth. The approximate date of the Syrian Fathers’ mission to Georgia can, however, be established by references to real personages and events. 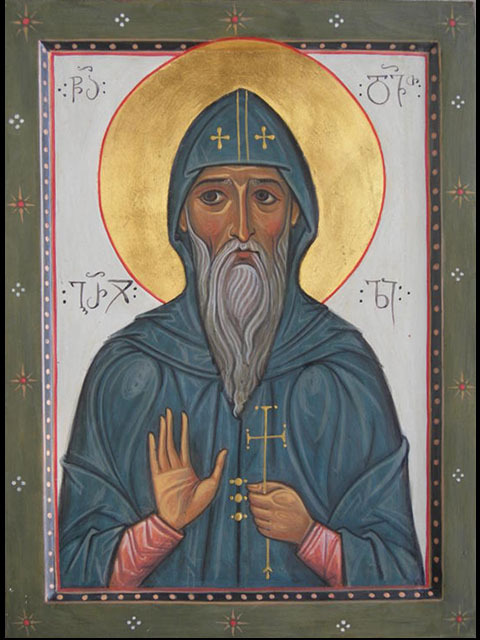 Thus, the life of St. David of Garesja mentions the Patriarch Elias of Jerusalem (494-513). 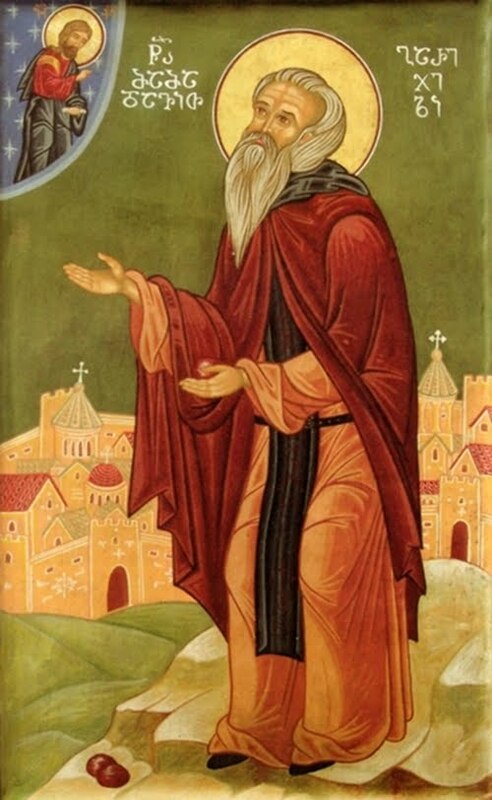 Lives of the twelve other Syrian Fathers refer to a visit to St. Simeon Stylites the Younger (521-97), who is described as sitting in an oven, which he is known to have done between the years 541 and 551. There is also a reference to the Persian king Khusraus’s siege of Edessa, which took place in 544. The Georgian chronicle known as The Conversion of Georgia says that the Syrian Fathers arrived some two hundred ears after St. Nino’s apostolate. These allusions combine to show that the Syrian Fathers arrived, or were traditionally supposed to have arrived in the Caucasus at various times between the end of the 5th and the middle of the 6th centuries. We also have to bear in mind that at the period under review the Georgian Church was itself sympathetic to the Monophysite cause. At the Council of Dvin in 506, the Armenian Georgian and Albano-Caucasian Churches united in condemning the dogma laid down at Chalcedon. Not until a century later did the Georgian Catholicos Kyrion formally reject the Armenian Gregorian doctrine and bring his flock back for ever within the Orthodox fold. When we recall that the Syrian Fathers arrived in Georgia at a time when Monophysite monks expelled from Syria were taking refuge abroad, and that the Georgian Church was then on the Monophysite side, we must conclude that the Syrian Fathers were indeed Monophysite refugees anxious to continue their religious work in the more tolerant and congenial atmosphere of Georgia. 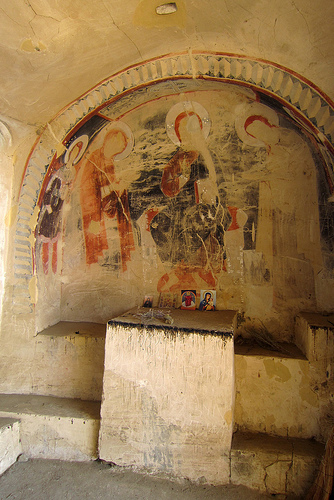 Sarcophagus of St. David Garejeli, the founder of the David Gareja cave monastery, inside the monastery, Republic of Georgia, Caucasus, Eurasia. This entry was posted on January 17, 2015 at 2:08 am and is filed under Uncategorized. You can follow any responses to this entry through the RSS 2.0 feed. You can leave a response, or trackback from your own site.